Action Taken on Climate Change: previously ignored, has soared to the top of people’s priorities around the world. PREVIOUSLY IGNORED, ACTION ON CLIMATE CHANGE HAS SOARED TO THE TOP OF PEOPLE’S PRIORITIES AROUND THE WORLD. 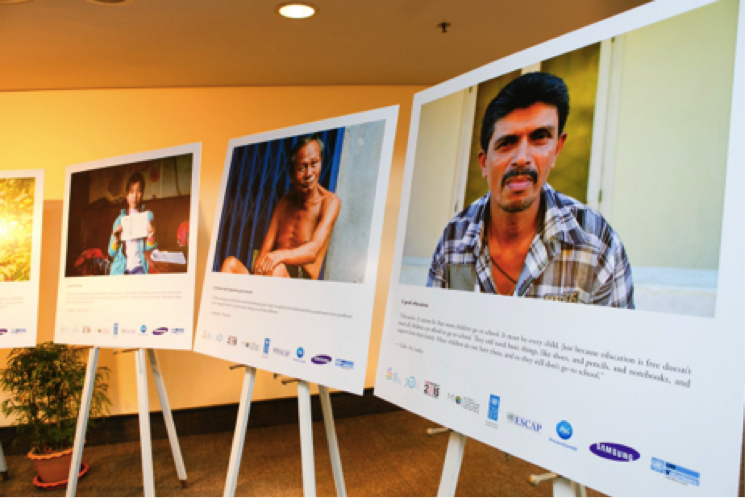 In 2015, 10 million people raised their voices on what mattered to them, their families and their communities in the largest global consultation ever undertaken by the UN. Out of 16 priority areas, Climate Action ranked dead last. 2 years later, Climate Action has soared to one of the top citizen priorities across the globe. The MY World survey was the driving force behind this consultation, which shaped the Sustainable Development Goals -the universal to-do list to end poverty, address inequalities and tackle climate change by 2030. This global survey, led by the United Nations and partners, aims to invite everyone to share their views with world leaders, to build dialogue between government and citizens and influence decision-making. According to the latest data of the global survey, ‘Action on Climate Change’ is either the top priority or one of the 4 greatest global challenges for people around the Globe. This is a big shift in people’s perception and an important message for everyone: governments, the UN, development activists and practitioners, and change agents. The questions asked are very personal. “What is most important for you and your family?”. It’s increasingly clear that people recognize that climate change is becoming an important issue for them in their daily lives. Every step taken for Climate Action is a step further in achieving the Sustainable Development Goals. The adoption of both the Sustainable Development Goals and the Paris Climate Agreement demonstrate the political will needed to end poverty and human suffering, while also protecting the environment that we and future generations depend upon for our for our health and prosperity. These agendas are closely interlinked and many of the actions taken to address the Goals are also helping people to fight and adapt to climate change. While governments have committed to the implementation of the Paris Agreement and the Sustainable Development Goals, all people can be part of this movement to make it a reality. Now is the moment for nations, private sector and organisations to listen to citizens and make the necessary changes to address these challenges. *This is not a representative survey. MY World is the UN survey that asks citizens if they are aware of the Sustainable Development Goals, which six of the 17 Global Goals are of immediate concern to them and if the situation of these has got better, stayed the same or got worse over the past 12 months. The UN SDG Action Campaign is a special initiative of the UN Secretary-General mandated to support the UN system-wide and the Member States on advocacy and public engagement in the SDG implementation. With a proven track record on innovative and impactful engagement techniques since 2002, the UN SDG Action Campaign works to create awareness about the Agenda 2030, empower and inspire people across the world to achieve the Sustainable Development Goals (SDGs) while generating political will, to make the Goals attainable by 2030. The Global Campaign Center in Bonn is a strategic hub to deliver the UN SDG Action Campaign’s mandate to inspire people’s action on the Sustainable Development Goals. The Global Campaign Center is central to the UN’s strategy of providing real-time cutting-edge advocacy support, big data expertise and analytics to Member States and partners across the globe. 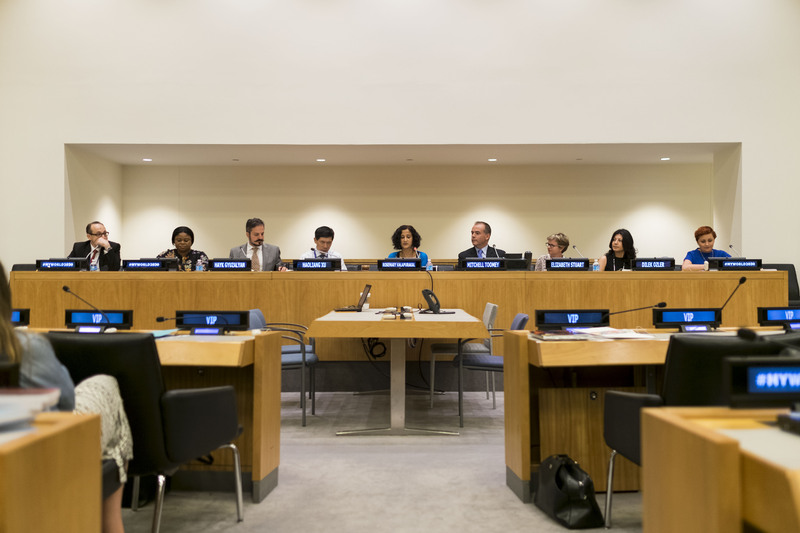 Master’s and doctoral students as well as faculty of the Education Academy of Computational Life Sciences (ACLS) International Summer School engaged on harnessing technology and data for the implementation of Sustainable Development Goals (SDGs) at the United Nations headquarters yesterday, 29 August 2016. This year’s ACLS International Summer School, led by Professor Yutaka Akiyama,Dr. Eng. and Professor Takashi Harada, jointly hosted by the Tokyo Institute of Technology and Cornell University, has the thematic background of the Sustainable Development Goals. 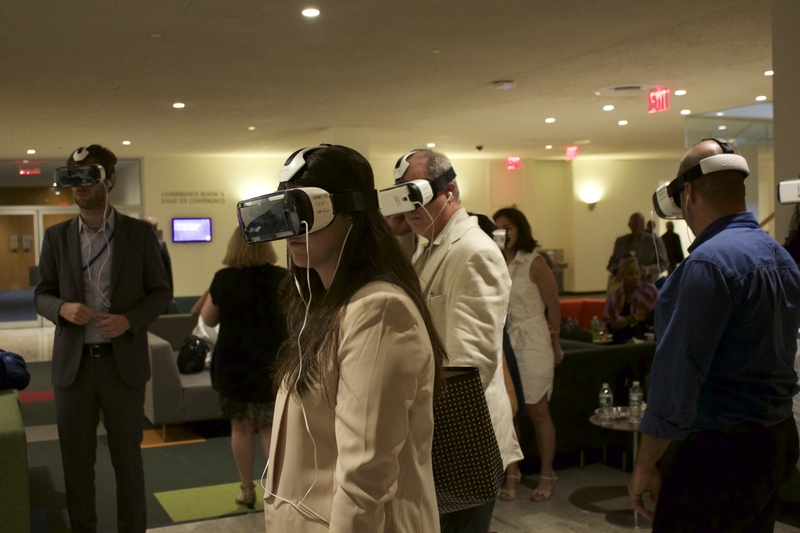 Therefore, students and faculty took a special tour of the SDGs: A People-powered Agenda – Leave No One Behind exhibition at the United Nations Headquarters, experienced the UN Portal installation and the UN Virtual Reality film series, before participating in a workshop and discussion on the SDGs. 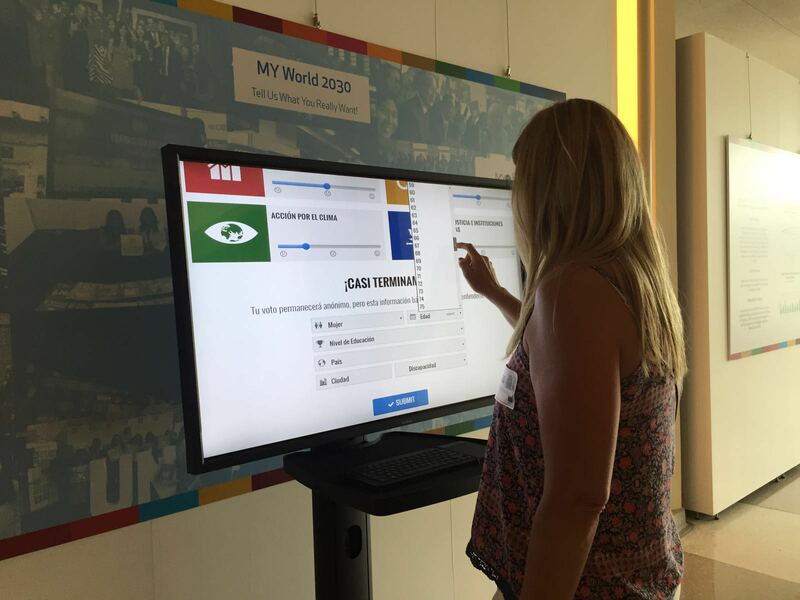 At the interactive exhibition, Summer School participants voted in the MY World 2030 Survey, the High Level Panel on Women’s Economic Empowerment’s special MY World 2030 Empower Women Thematic Survey and wrote their commitment to the SDGs on the blackboard. After experiencing the human stories behind today’s pressing challenges through the UN Virtual Reality film series, students were able to converse live with internally displaced people (IDPs) inside the Harsham camp on the northern edge of Erbil, Iraq, through the UN Portal. Harsham is a camp that hosts more than 1500 internally displaced Iraqi families who fled Mosul and its surrounding villages to escape Islamist militant attacks. Later, students and professors engaged in a SDGs workshop collaboratively held by the UN SDG Action Campaign, the UN Department for Public Information (DPI), the UN Development Programme (UNDP) Gender Team, and the UNDP Sustainable Development Team. Antje Watermann, UN DPI, provided an overview of the SDGs framework and communication strategies for advancing them. In particular, she highlighted the interconnected, universal, inclusive and transformative nature of the 2030 Agenda. The UNDP Gender Team’s Henny Ngu spoke on utilizing technology to achieve gender equality. Sustainable Development Goal 5, “Achieve gender equality and empower all women and girls”, tasks UNDP to contribute to the eradication of poverty and the significant reduction of gender inequalities by empowering women and promoting and protecting their rights. Alice Chen, UN SDG Action Campaign, presented on how students and scholars can get involved in SDGs implementation and advocacy, especially by drawing upon technology and data. For instance, the Campaign’s MY World 2030 Survey is a tool for localizing, monitoring and promoting accountability of the new agenda through 2030. 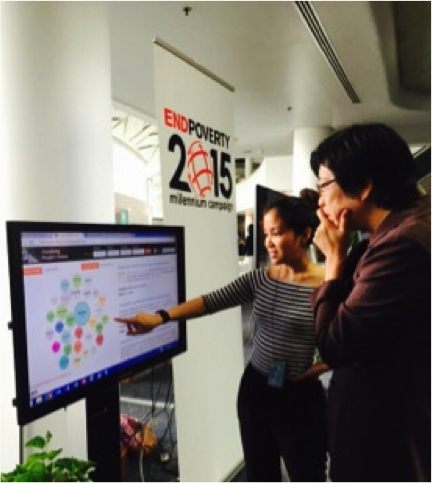 In addition, exhibitions and data playgrounds have provided interactive displays of citizen-generated data and storytelling initiatives on the SDGs, as well as videos and new media content on the SDGs worldwide. 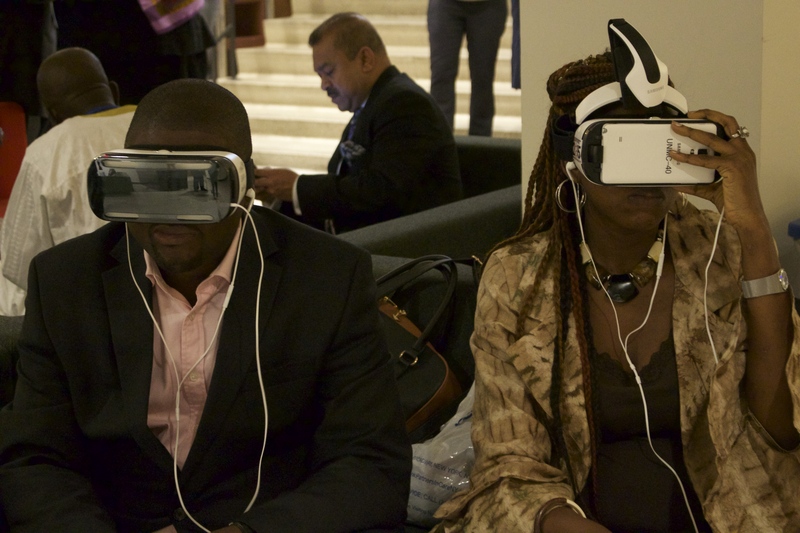 Furthermore, United Nations Virtual Reality amplifies the voices of the most vulnerable in danger of being left behind, allowing them to narrate their story from their own perspective and in their own words. UNDP Sustainable Development Team’s Yuqiong Zhou concluded the workshop by outlining UNDP’s work on integrating the SDGs and the ways they will programmatically support countries to achieve the 2030 Agenda. The presentations were followed by enthusiastic discussion by student and faculty. The audience was particularly interested on how the indicators would be measured, the expectation from different Member States in terms of how they would work towards achieving the SDGs, and most importantly, what scholars can do to contribute to the realization of the goals by 2030! Happy Holidays & See You in 2016! 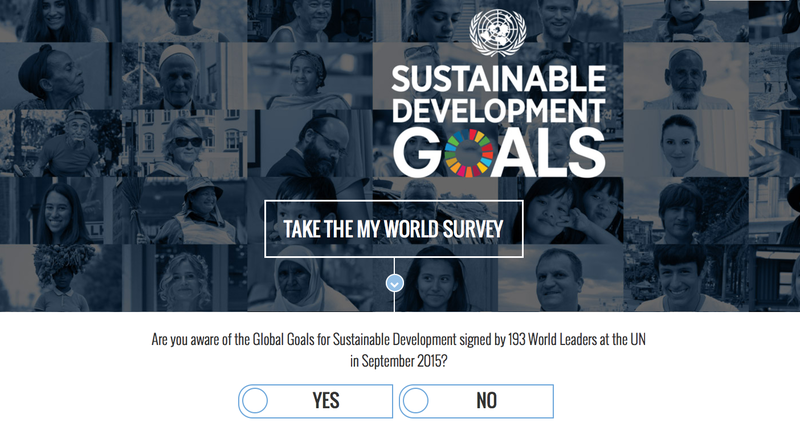 Thanks to your outstanding contribution to the MY World survey, almost 10 million people from 194 countries had a say in the political deliberations that led to the historic adoption of the Sustainable Development Goals (SDGs) by all the UN Member States in New York on September 25th, 2015. …and we count on you as a MY World partner to continue playing a key role!! MY World 2030 is the next generation of MY World surveys, and it is bigger and better! 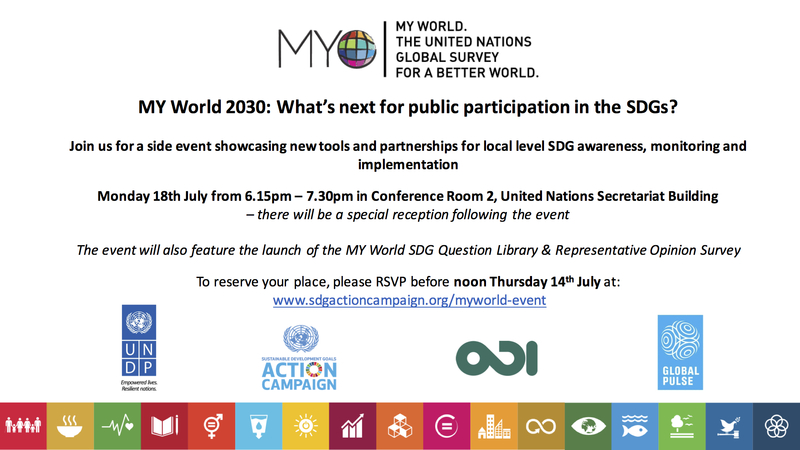 Please visit the MY World 2030 beta site at https://myworld2030.org and send us your feedback and click here for an overview describing the next phase of the initiative. As you will see, MY World 2030 is designed to allow people from around the world to tell the UN which of the 17 SDGs they are most passionate about and to reflect on progress over the next fifteen years. Once again, the support of MY World partners will be critical for the success of MY World; and particularly in reaching out directly into communities and drawing the digitally disconnected, illiterate and poorest communities into the global debate. Thank you for your continued support! We very much look forward to continuing working with you in this new and very exciting phase!!! We reflect with pride on how much has been achieved; the call for action on the Millennium Development Goals has resonated across the globe, and peoples from all corners of the world have participated in consultations on the future development agenda, as well as in the unprecedented MY World survey, which gathered over 8.5 million votes from 194 countries. El presidente Danilo Medina recibió de manos de la vicepresidenta, Margarita Cedeño, y del coordinador residente del Sistema de las Naciones Unidas, Lorenzo Jiménez de Luis, el informe sobre la participación dominicana en la encuesta Mi Mundo. 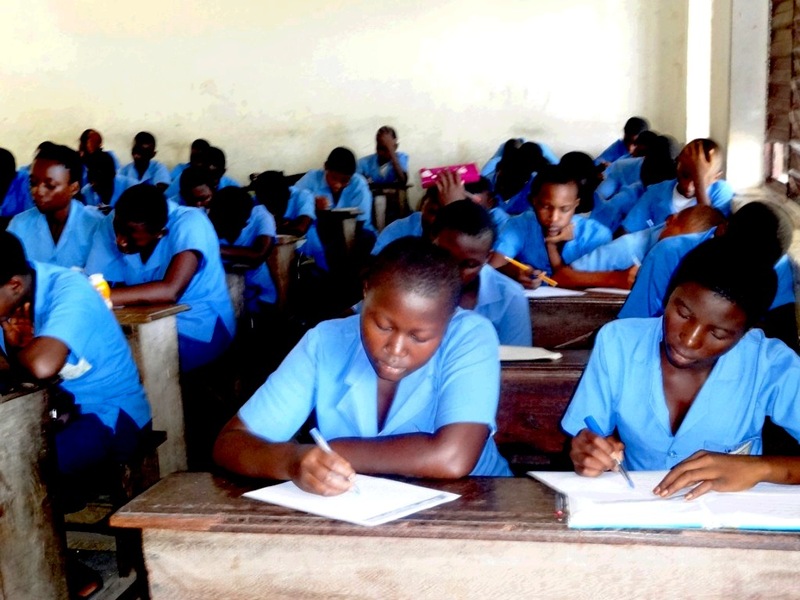 Blog by Asaah Gideon, co-founder and Chief Operating Officer of Educate a Child in Africa (ECA). Educate a Child in Africa (ECA), a nonprofit and nongovernmental organization that uses non-formal education and the media to inspire a passion for consequential formal education in children in Africa recently administered one thousand six hundred and thirty (1,630) MY World survey questionnaires to young Cameroonians from the towns of Limbe and Buea of the South West Region of Cameroon. The implementation of MY World survey questionnaires was part of the Building Bridges project that focuses on the priorities of young men and women at the grassroots level and their vision of the world in 2030 based on the Post-2015 UN Development Agenda. The young people who participated in this exercise ranged from the ages of 15-35 years and represented the 10 regions of Cameroon. MY World survey questionnaires were administered in colleges, higher educational institutions, places of work, religious groups, associations, homes and the man on the streets. They were asked choose 6 out of 16 options based on what is of most interest to them and their families, the world they want. The survey results were officially presented in a conference that was organized by Building Bridges (BB) and Educate a Child in Africa (ECA) in the University of Buea, Cameroon on the 9th of June. The first three aspects of the world young people in Cameroon want as portrayed by the results are quality education, better job opportunities, access to clean water and sanitation, better transport and roads, better health care and honest and responsive government. Though some of these young people clearly doubted the possibility of their choices being directly implemented in their country, most of them were however very excited to learn that the United Nations was interested in the opinion of the world they want. 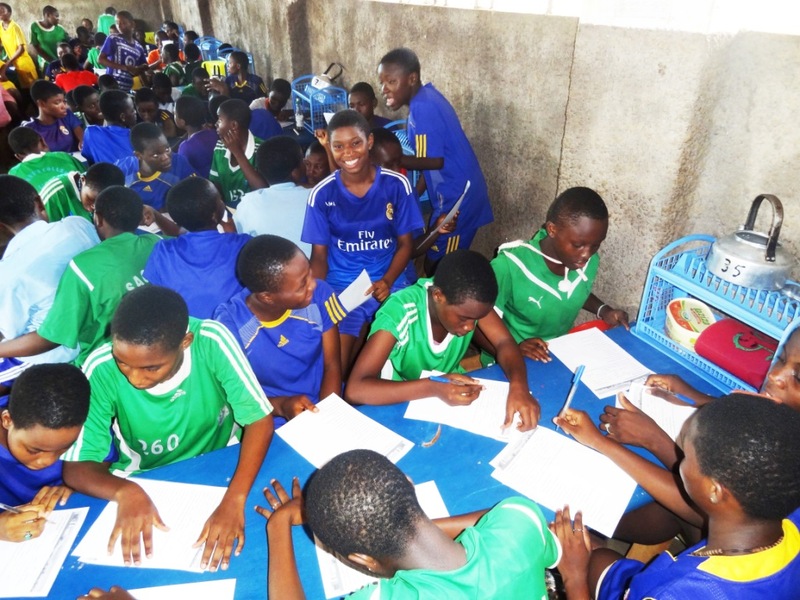 In general, the MY World survey in Cameroon was well responded to and the young people even raised personal concerns that were not listed among the sixteen articles which will would positively affect their livelihood. 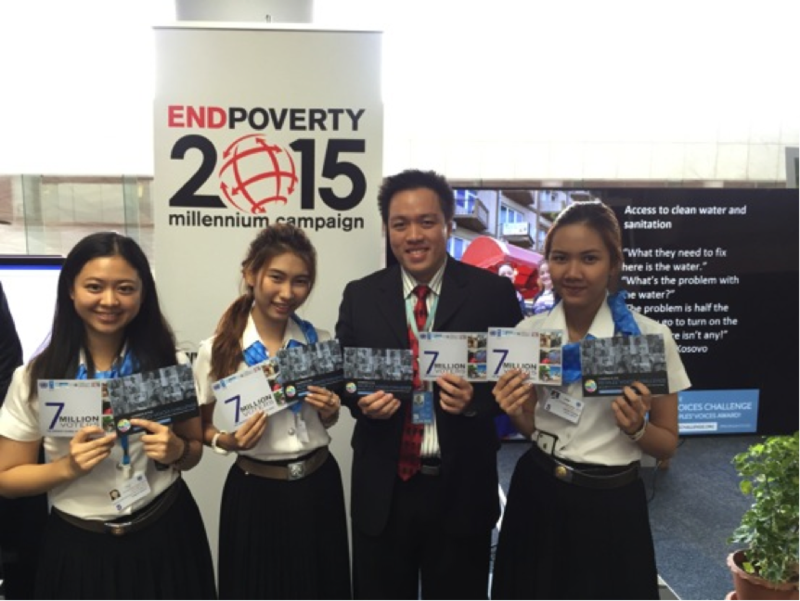 ESCAP Youth Volunteers Celebrate 7 Million Voices and the Peoples’ Voices Challenge! 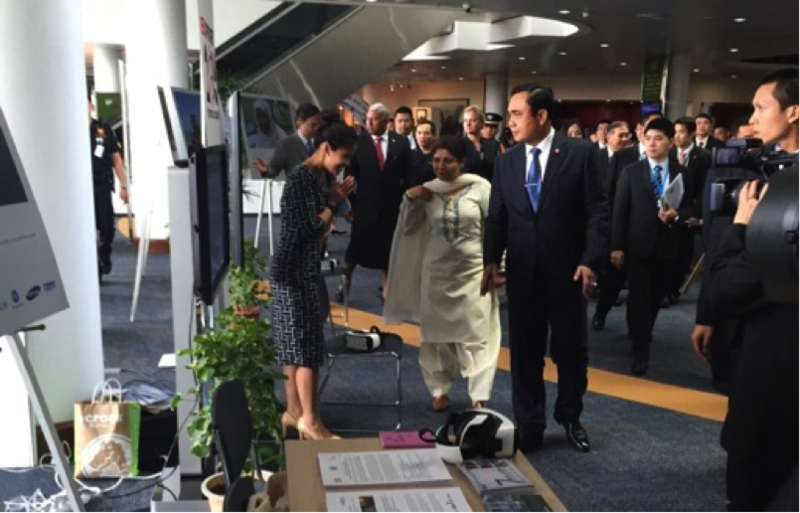 As “We the Peoples” Data Playground World Tour kicks into high gear in preparation for the 70th UN General Assembly and the announcement of the post-2015 development agenda, we showcased peoples’ voices through cutting-edge technology at the Asia Pacific Forum for Sustainable Development 2015 (APFSD 2015) and the 71st Session of the Economic and Social Commission for Asia and the Pacific (ESCAP). 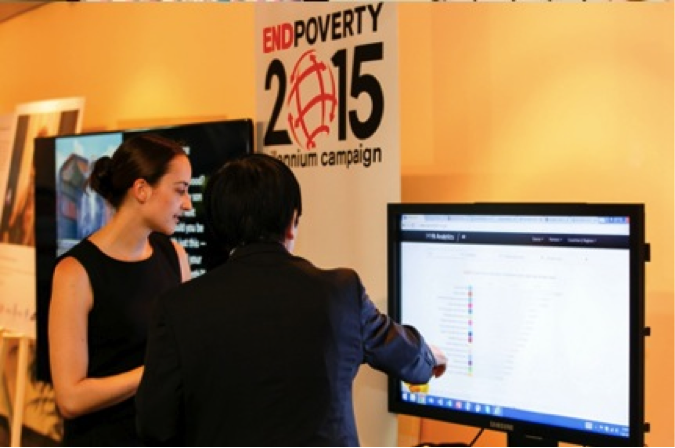 From May 25-29, 2015, the UN Millennium Campaign, in partnership with UNESCAP, UN Volunteers, UNDP, P&G, and Samsung, hosted an interactive Data Playground. 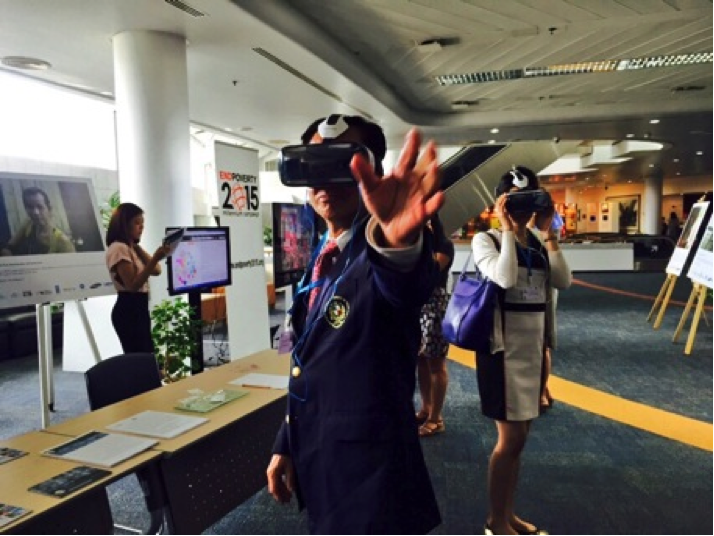 Delegates from around the world explored the MY World data, participated in the special screening of the virtual reality film, Clouds of Sidra, reviewed the Humans of MY World (HOMY) photo exhibition, and were invited to join the Peoples’ Voices Challenge. Diplomats, academics, ministers and delegates used Samsung touchscreen technology to disaggregate the MY World Dataset by region, country, gender, education levels, age groups and HDI and live data visualizations on the global, regional, and local post-2015 conversation on the World We Want were highlighted. Out of the over 7.5 million people who have voted in the MY World survey, approximately 3.13 million people, or over 41%, are from the Asia-Pacific Region. Using data, policy makers were able to answer the question on everyone’s mind: what kind of world do Asians really want? They discovered in Asia that the top priorities are “A good education”, “Better healthcare”, and “An honest and responsive government”. We believe that behind every MY World vote there’s a personal story that deserves to be told. That is why with the HOMY exhibition, we wanted to go one step further and look beyond the data to help policy makers understand WHY people have voted the way they have? What is the reason for choosing one priority above the other 15 priorities? Sponsored by P&G, the beautiful HOMY exhibition featured MY World voters from different backgrounds. A woman from the transgender community in Manila, the Philippines spoke to policy makers through HOMY. She chose “Freedom from discrimination and persecution” as her top priority because she “wants a whole world without discrimination. Being different means being hurt. On the inside, and maybe the outside as well. I pray it won’t always be like that.” We had the distinct honor to present the HOMY exhibition to the Prime Minister of Thailand, H.E. Mr. Prayut Chan-o-cha. 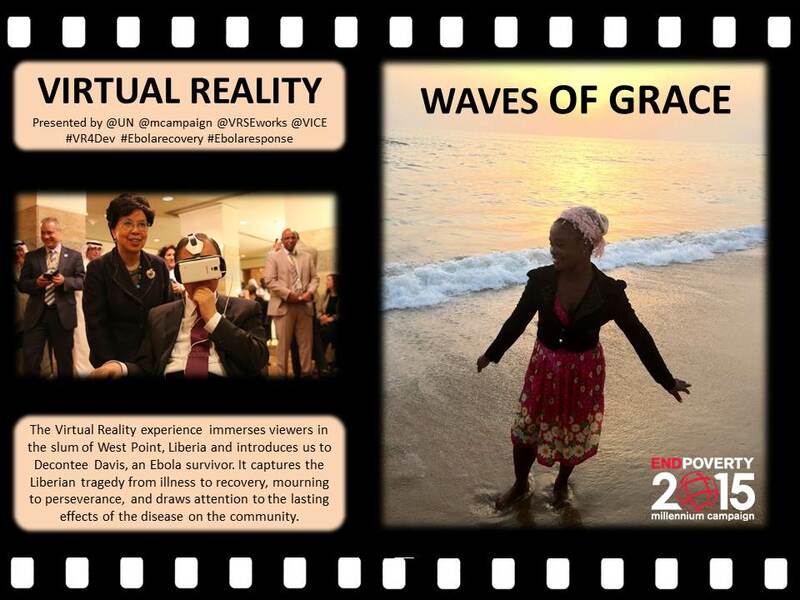 Recently, we initiated a project to bring the world’s most pressing challenges home to decision makers and global citizens around the world through Virtual Reality (VR). 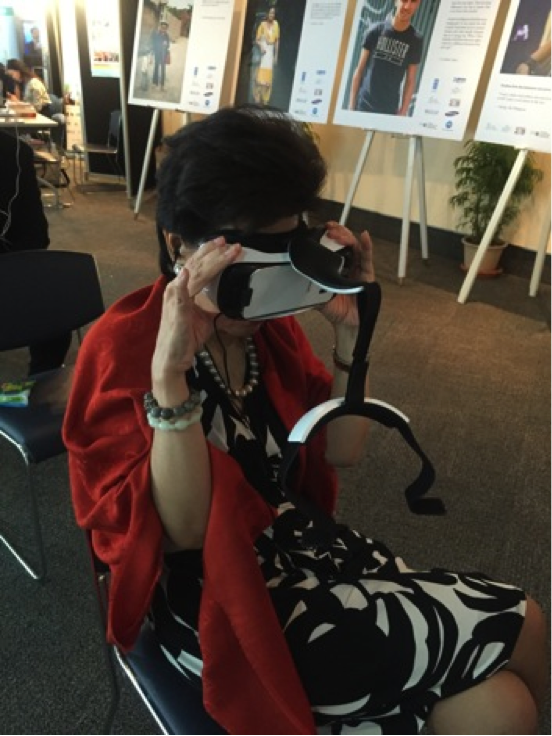 VR allowed APFSD 2015 and Regional Commission delegatsd to meet a 12-year old Syrian girl named Sidra living in a refugee camp. Sidra took them on a tour of her new home, into her new classroom, and brought them to dinner with her family. 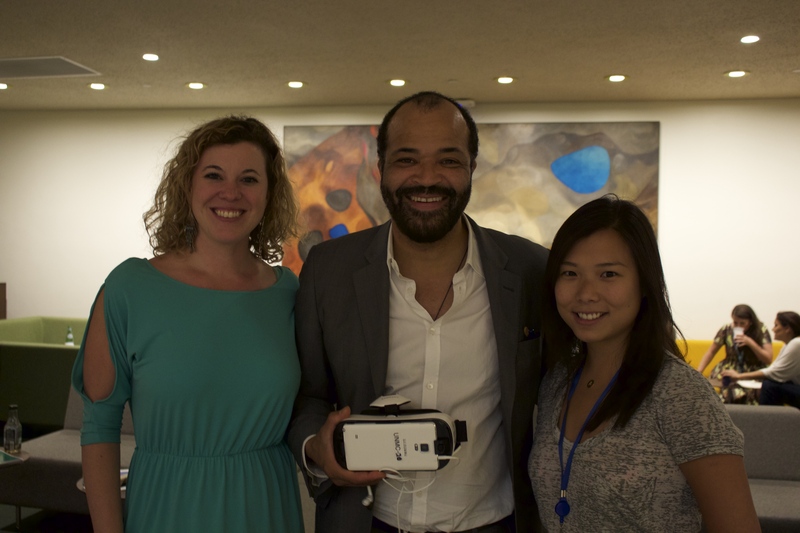 As the first UN virtual reality documentary, we wanted to push the boundaries of empathy by bringing humanity to the front of the global development discussion. 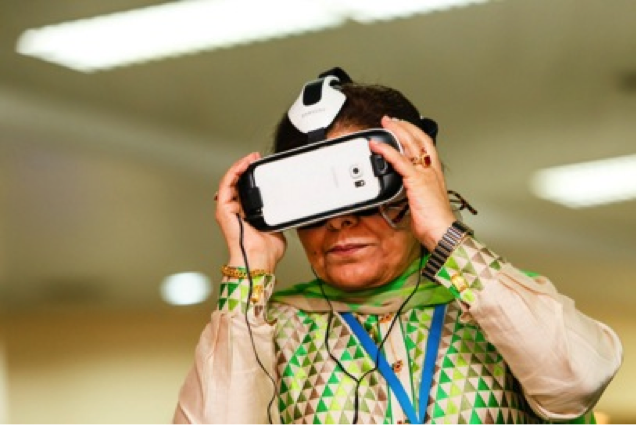 The VR film had a profound affect over her audience, one delegate said after watching that Clouds Over Sidra is the “most beautiful thing I’ve ever seen in my life”.